Human Umbilical Cord Mesenchymal Stem Cells (UCMSC) were isolated from Wharton’s jelly of full-term foetus umbilical cord. In the Human Umbilical Cord Mesenchymal Stem Cell Growth Medium (Cat.No. 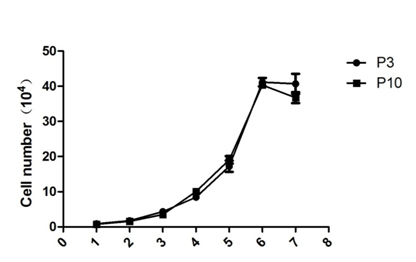 GSB9001), UCMSC can expand for more than 15 passages without significant senescence (Figure 1), and persist high proliferation ability even at passage 10 (Figure 2); Flow Cytometry analysis show that they are positive for CD29 (99.93%), CD44 (99.5%) and CD105 (99.94%), and negative for CD34 and CD45. They also keep the ability of differentiating into osteoblast and adipocyte etc. 1. Remove and discard culture medium, and rinse the cell layer with 0.25% (w/v) Trypsin - 0.53 mM EDTA solution to remove the serum. 2. Add 1.0 mL of Trypsin-EDTA solution to a T25 flask, and place it at 37°C for 3 to 5 minutes until cell layer is dispersed. 3. Add 1.0 to 2.0 mL of complete growth medium and aspirate cells by gently pipetting. 4. Transfer cell suspension into a 15 mL tube and centrifuge for 3 min at 300×g. 6. Transfer cell suspension into new culture vessels with a subcultivation ratio of 1:3 to 1:5. 7. Incubate cultures at 37°C, 95% air and 5% carbon dioxide (CO2).